NOTE: This is not an accurate representation of Cambria County. All the boroughs are removed for the purpose of this "clickable" map. You will need to use your browser's "BACK" button to return to this page. Please note that these are large graphic files and will take a while to load. 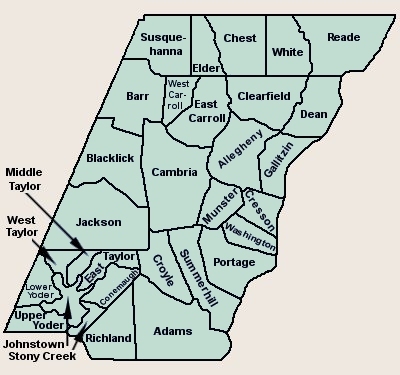 The Johnstown maps lack the detail of the township maps and are not included.